Ocean Dreams development along Coney Island’s Reigelmann Boardwalk. Image: Courtesy of Dattner Architects. 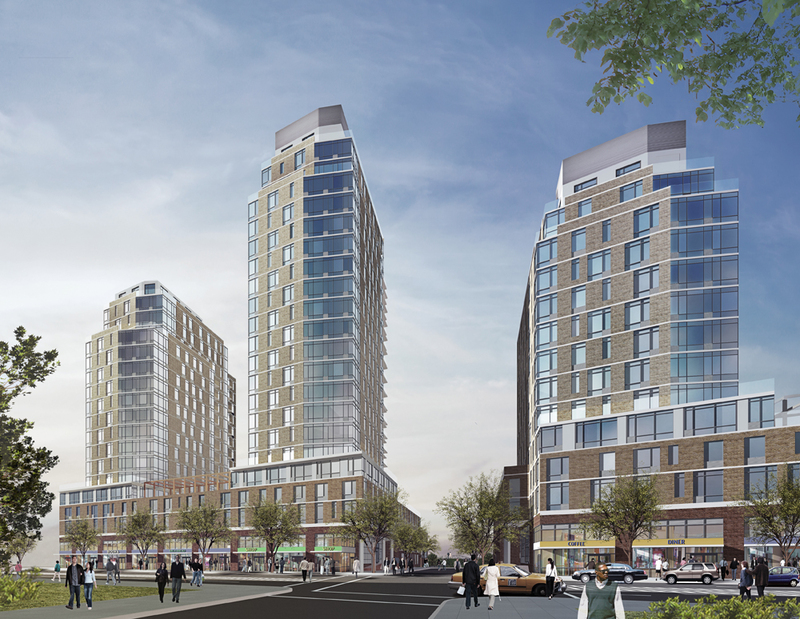 Multi-building project will create 415 rental units along Coney Island’s boardwalk. On September 8, 2011, the City Council approved John Catsimatidis’s proposed 415- unit, mixed-use project on two vacant parcels on the western end of Riegelmann Boardwalk in Coney Island. The project site consists of an eastern and western parcel separated by West 36th Street and bounded by Surf Avenue to the north, the boardwalk to the south, West 35th Street to the east, and West 37th Street to the west. The site is located nine blocks west of the Coney Island Special District which the City created in 2009 to revitalize the area. 6 CityLand 104 (Aug. 15, 2009). The 428,000 sq.ft. project, known as Ocean Dreams, will include both low- and high-rise structures to provide 415 market-rate apartments, 418 parking spaces, and up to 24,750 sq.ft. of commercial space. In 2005, the site’s former owner received City approval for a 313-unit project, also known as Ocean Dreams, which was never developed. 2 CityLand 137 (Oct. 15, 2005). On the western parcel, Catsimatidis will build a three- to five story L-shaped building with a fourteen-story tower rising to 164 feet. The building will include 104 apartments and 3,640 sq.ft. of groundfloor retail space along Surf Avenue. The eastern parcel will feature a U-shaped building with a three- to six-story base opening to the boardwalk. The building will include an eighteen-story tower on the east side of the parcel and a 22-story tower on the west side of the parcel. This building will provide 311 apartments with 11,570 sq.ft. of retail space along Surf Avenue and up to 9,580 sq.ft. of potential retail space along the boardwalk. The fourteen-story building will house a 149-space enclosed parking garage, and the multi-tower building would include a 269-space enclosed garage. The garages will be built above grade due to the area’s high water table. Landscaped courtyards above the garages will feature recreational facilities for the buildings’ residents. Catsimatidis submitted multiple applications, including requests to rezone the project site from R6A to R7-3 with a partial C2-4 commercial overlay, and for special permits to modify height, setback, and lot coverage requirements. The Commission unanimously approved the project, finding that it would complement the City’s plan to revitalize Coney Island. Regarding affordable housing, the Commission acknowledged receiving a letter from Catsimatidis stating a commitment “to explore opportunities” to include a moderate-income housing component in the project. At the Council’s Zoning & Franchises Subcommittee hearing, local Council Member Dominic M. Recchia Jr. expressed his support for the project and thanked Catsimatidis for “taking a big risk” with the proposed development. Recchia stated that the community “needed a mechanism” to develop the western end of Coney Island’s boardwalk, and he believed that the project would accomplish this goal. Lead Agency: CPC, Cond. Neg. Dec.
Council: Ocean Dreams (C 110058 ZMK – rezoning); (C 110059 ZSK – spec. perm. ); (C 110060(A) ZSK – spec. perm. ); (C 110061 ZSK – spec. perm. ); (C 110062(A) ZSK – spec. perm.) (Sept. 8, 2011) (Architect: Dattner Architects).